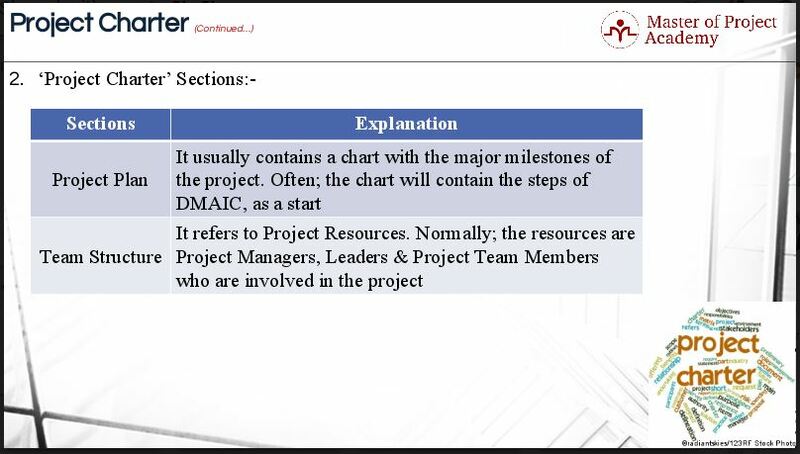 Most Six Sigma projects follow the DMAIC protocol. As you would learn during online Six Sigma courses on the topic, DMAIC stands for Define, Measure, Analyze, Improve and Control. In this article, we will focus on the first element of the Six Sigma approach – Six Sigma Define Phase – and the most important document in this stage: Six Sigma project charter. The official authorization for the project is summarized in a document called the Six Sigma project charter. The project charter is a sponsor document. The Six Sigma project charter essentially is a contract for work between the project sponsor and the project team. The Six Sigma project charter describes the high-level requirements for project success. The Six Sigma project charter is a key document that defines the scope and purpose of any project. Each Six Sigma project has a finite duration with a definite beginning and end. If it doesn’t, then probably project team need to re-evaluate its feasibility study. The Six Sigma project charter is incomplete until the project sponsor approves it and communicates it to the appropriate stakeholders. 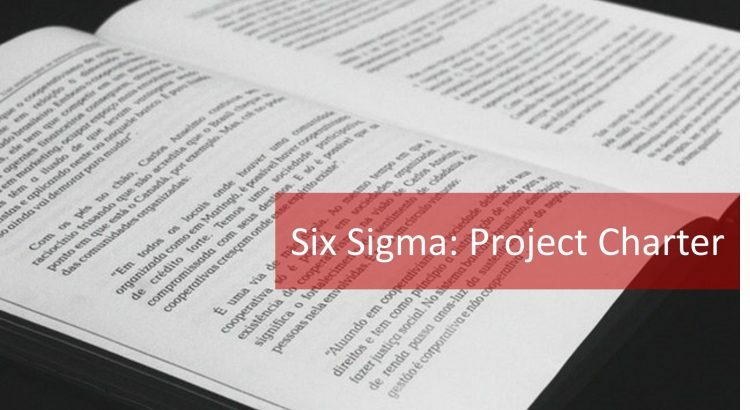 Developing and publishing the Six Sigma project charter is the first step in commissioning a project—before any work begins. The Six Sigma project charter, though a simple document, requires significant preparation time. To draft the Six Sigma project charter in the right manner, the project team should be well-versed with each element. Let us have a look at each element to understand it better. Let us have a look at the 7 project charter elements Six Sigma to understand it better. The first element in the Six Sigma project charter is the business case. The business case contains a description of the Big Y, i.e., the reason for taking up the project. It defines the quantifiable benefit of the project and how it aligns with business strategy or goals in the Six Sigma project charter. The business case identifies the dollars to be saved and establishes how the project aligns with the organization’s strategies. The second element of the Six Sigma project charter is the problem statement. It is also called an opportunity statement. Why opportunity statement? Well, an opportunity refers to process improvement or process excellence opportunity to exceed stakeholders’ expectations. The problem statement in the Six Sigma project charter may refer to business problem or pain, and an opportunity statement refers to improvement opportunity. At this point, we are not looking at possible causes yet. The Six Sigma project charter looks at the problem, not the solution. 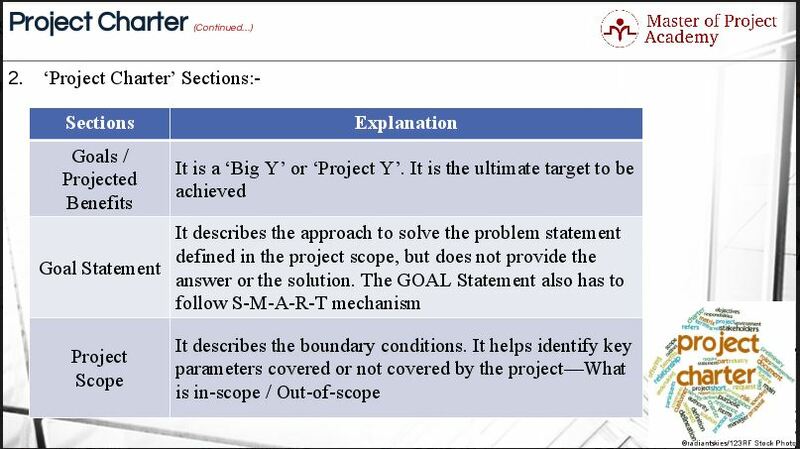 Six Sigma Project Charter problem statement has to follow S-M- A-R- T mechanism. Let us have a look at an example problem statement. You can notice the difference between poorly drafted problem statement and properly drafted problem statement. It is a poorly drafted problem statement. Yes, having high inventory levels is a problem but a problem statement containing so little information significantly reduces your ability to take specific action and obtain improvement. This is not sufficient for the Six Sigma project charter. Look at the amount of information that is available in the revised problem statement. Anybody referring to this kind of problem statement would know how long the problem has been appearing for, the magnitude or size of the problem and how much it is costing the business. The third element of the Six Sigma project charter is goals or projected benefits. This column refers to the objective of the improvement idea in quantified terms. Reducing turnaround time, which is abbreviated as TAT, from 48 hours to 24 hours concurrently increasing the daily volume coverage from 90% in 48 hours to 93% in 24 hours. The estimated soft or notional savings, on account of more than 50% reduction in TAT, are equivalent to 257,000 USD. The savings computation is enclosed herewith. The fourth common element of the Six Sigma project charter is the goal statement. The goal statement describes what success looks like. 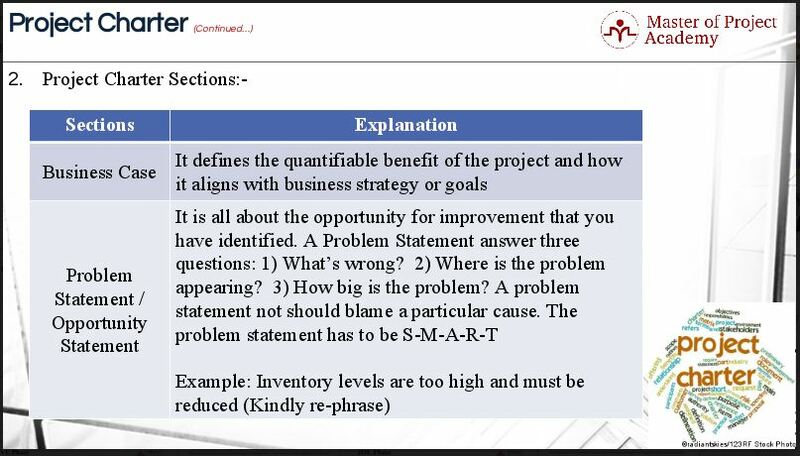 It describes the approach to solve the problem statement defined in the Six Sigma project charter but does not provide the answer or the solution. The goal statement does not say how the goal will be achieved. If the project team knows how to achieve the goal, then they do not need to work on a Six Sigma project. They cannot have the solution in the beginning of the project. It would defeat the purpose of the project. The goal statement defines the relief expected from the team’s work. The fifth element of the Six Sigma project charter is the project scope. It describes the boundary conditions and identifies key parameters covered or not covered by the project. The sixth element of the Six Sigma project charter is the project plan. The project plan usually contains a chart with the major milestones of the project. Often, the chart will contain the steps of DMAIC (Define, Measure, Analyze, Improve, Control) as a start. The team will need to follow the chart with a more detailed project plan A project plan should answer the key questions of “Who, What, Where, When, How, and How much.” This covers the resources which are: People, Facilities, Equipment, and Materials that will be needed. The plan also identifies project activities with a schedule that includes an estimate of when each activity will take place, and what resources are required to finish the tasks the project plan document is expected to change over time as more information about the project becomes available. The seventh element of the Six Sigma project charter is the team structure. The team structure refers to project resources. Normally, the resources are Project Managers, Leaders and Project Team Members who are involved in the project. And now you know all the elements of the Six Sigma project charter!